I was able to create this cool paper piece that you see below thanks to Helen Hiebert‘s new book, which provided me with the pattern. This GIF animation demonstrates how the mechanism works when you move the little tab with the arrows up and down. The pattern comes blank, like a white canvas full of possibilities. I drew the red elements on my piece with a ballpoint pen, after the mechanism was already assembled. So much fun! 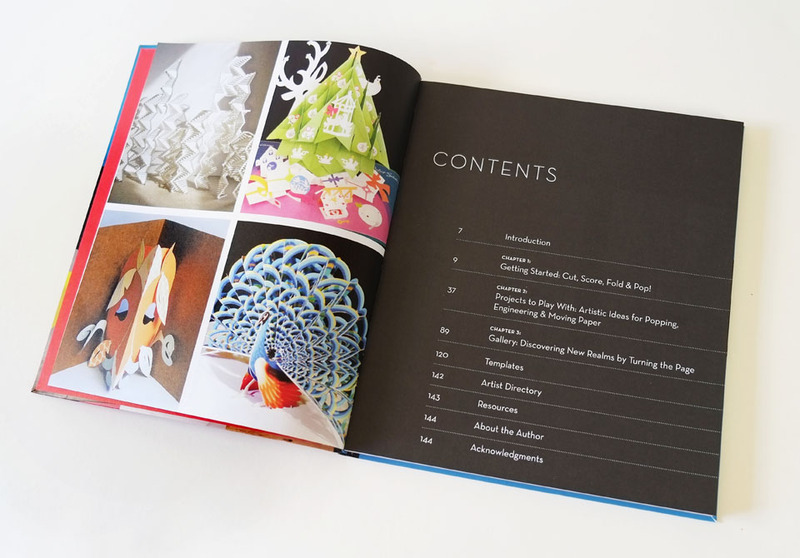 In her book, Helen Hiebert invites you to explore the enchanting world of pop-ups and handmade paper crafts through 20 different projects. The first five are simpler projects to help you warm up. The next 15 are more elaborate. Some of them, such as the one that I decided to try, requires precise cuts, but with a bit of patience anybody with regular fine motor skills could do it. 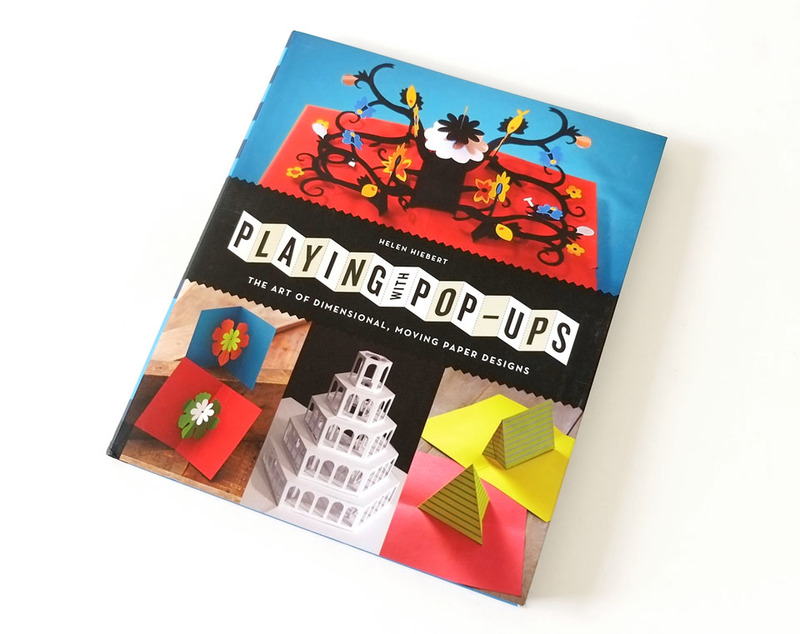 About this book, Ann Martin from All Things Paper says: “Playing with Pop-Ups is a book that will appeal to makers of all ages… well, at least those who are old enough to safely handle a craft knife! I enjoyed learning about the history of pop-ups and found the early examples fascinating. Pop-up and paper engineering terms are clearly explained and necessary supplies are detailed.” From Ann’s review on Amazon. 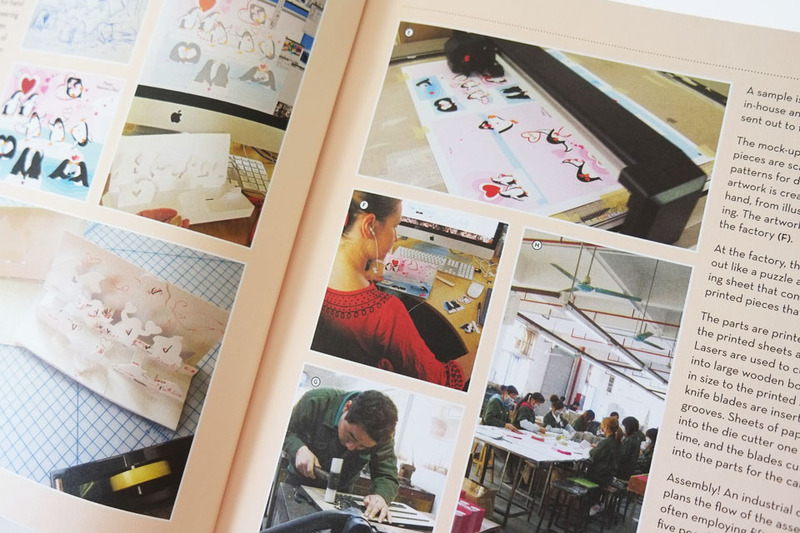 Something that I specially appreciated about this book were the 2 pages dedicated to explaining the production of a pop-up in the factory. It is the first time that I see this often overlooked detail in a book on this subject. 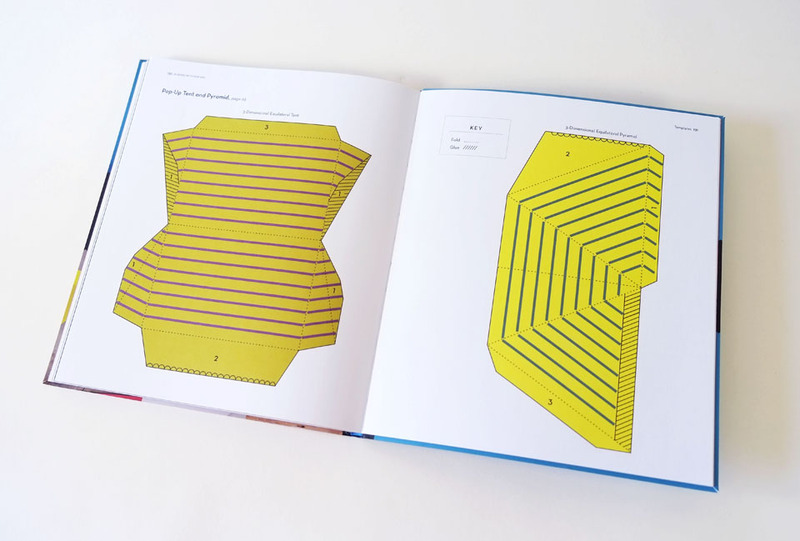 Another great thing about Playing with Pop-Ups is hat that it gives you a link where you can download all the same patterns that appear in the book. The advantage of using the digital files is that you can format them easily from your computer. I reduced mine to a smaller scale. 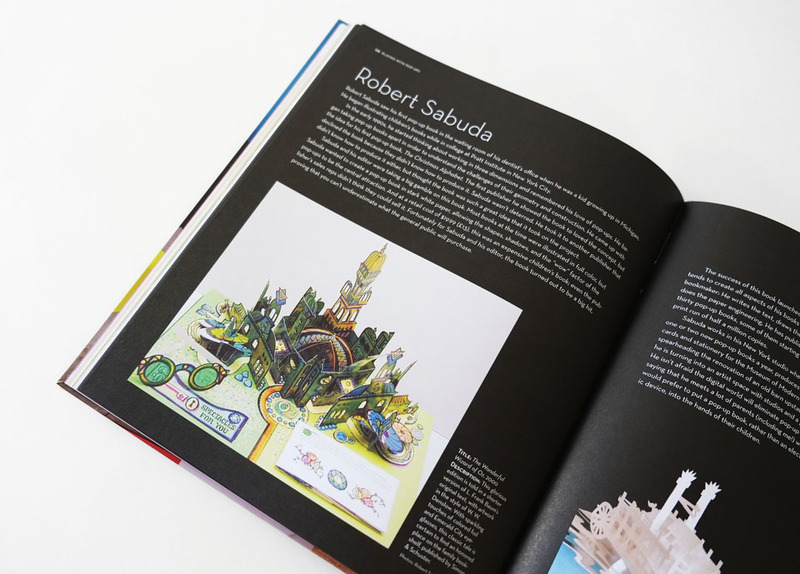 There is also a treat at the end of this book: a gallery of work by acclaimed pop-up artists. Perfect for inspiration! I recommend Playing with Pop-Ups. 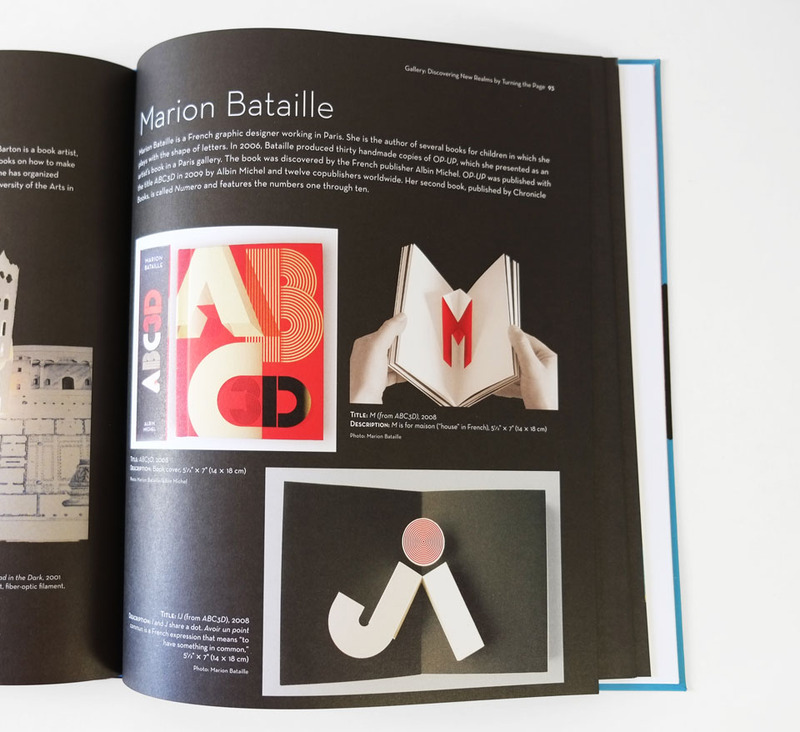 The Art of Dimensional, Moving Paper Designs to anybody who wants to have fun with paper. Thanks a lot, Helen Hiebert, for the great work. And thanks a lot to each of the wonderful artists that contributed to this project. This is my most most satisfying online shopping time, logistics quickly, attitudes of service, the next will patronize drop! This is my most satisfying online shopping ever pair of shoes, beautiful colors, good workmanship, the key is very comfortable to wear.